Solaire Infrared Grills are the Best Hot Grills available. A small grill with the same power as the larger ones, the 21XL can fit into most yards or balconies while offering the same cooking ability as the other grills. 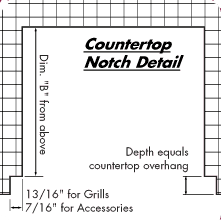 Built In: W = 21", L = 25", H above counter (Hood Down) = 12 7/8", H above counter (Hood Up) = 25 1/8"
Angular Pedestal: W (Shelves Down) = 27 1/2", W (Shelves Up) = 45 3/8", L (Hood Down) = 25", L (Hood Up) = 26", H (Hood Down) = 48", H (Hood Up) = 60 1/4"
Is your island made from combustible material (such as wood or plastic)? You will need the Insulated Jacket, Item #SOL-IRIJ-21XL (see item for cut-out dimensions). 20" width, 21" depth, 7 7/8" height. Click the button below to add the 21XL Solaire Infrared Grill (Angular Pedestal Pictured) to your wish list.